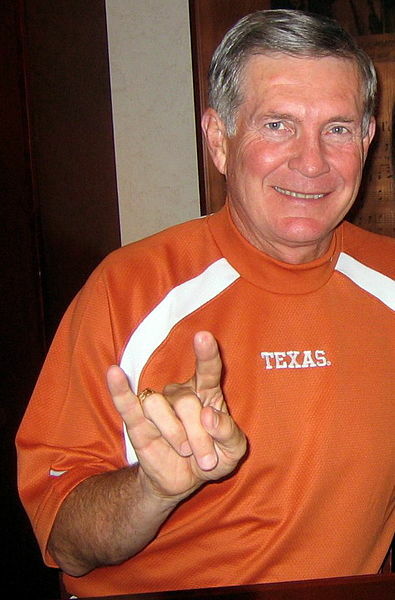 Will Mack Brown continue to hook the horns? College football isn’t giving us the most compelling slate of games this Saturday. The Gameday crew at ESPN looked at it and went to Fargo, North Dakota. However, college football never disappoints for drama. Texas coach Mack Brown has provided plenty, as everyone talks about his replacement while his team struggles. I’ll have more to say about what Vegas thinks of Texas. But first, let’s look at two intriguing games. The Vegas line had them as more than a 5 point favorite at home against a good Wisconsin team last Saturday. ASU won by 2 when the referees failed to give Wisconsin the chance to kick a game winning field goal. If you haven’t seen this truly bizarre play, click here. The announcer is wrong. Wisconsin’s quarterback did put his knee on the ground. Moreover, Arizona State struggles against teams that can run the ball. They rank 108th in my rush defense rankings (yards per rush adjusted for schedule), and Wisconsin racked up over 7 yards per rush last week. Stanford bring a big, physical offensive line, very similar to Wisconsin. They roughed up a good San Jose State team in their opener. My team rankings predicted more than a 10 point win for Stanford at home. With a stellar defense and a rush offense that should dominate, Stanford should win by more than the 6.5 points predicted by Vegas. A Big Ten team plays a cupcake school at home. The Big Ten team should win. Vegas opened with Minnesota as a 6.5 point favorite against San Jose State. Minnesota is the definition of mediocre. They finished last year ranked 82nd in my team rankings. With a host of returning starters, including star defensive tackle Ra’Shede Hageman, my preseason rankings project them at 67th. San Jose State was spectacular last season. They pushed Stanford to the limit in Palo Alto before losing. They lost to Utah State (10th in my rankings) but won every other game. With their convincing margin of victory against weak teams, San Jose State finished 24th in 2012. San Jose State lost coach Mike MacIntyre to Colorado. However, they return most of the offense, including a NFL prospect at QB, David Fales. Despite these returning starters, it’s reasonable to expect San Jose State to regress this season, as my preseason rankings have the Spartans at 48th. However, San Jose State is better than Minnesota. As proof, the line has shifted from 6.5 to 3.5 in favor of Minnesota. Moreover, Minnesota QB Phillip Nelson is doubtful for the game. San Jose State has better than a 50% chance to win this game. A week ago, both Texas and USC were struggling. It gave college football die hards the chance to talk about their replacements. I thought Texas coach Mack Brown was in more trouble. Brown made the desperation move of firing his defensive coordinator and hiring Greg Robinson. In case you might have forgotten, Robinson was the DC at Michigan when that unit imploded the last two seasons under Rich Rodriguez. They both got fired, and new DC Greg Mattison immediately improved the defense the next season with many of the same players. Last week, I correctly picked Mississippi to beat Texas in Austin on the Onside Sports app. You should download this app. It’s a great way to follow sports and interact with others. If you’re on an iPhone, click here. Now, the media has reached a frenzy with speculation that Alabama coach Nick Saban will become the Texas coach. With the undying love that Saban has for the media, I can’t imagine his inner anger over dealing with Texas questions for the next 4 months. Texas plays Kansas State at home this weekend. Vegas still favors Texas by 5.5. Since my predictions vary from Texas by 9.8 to Kansas State by 5.3, I’m believing in the wisdom of crowds on this one. While this isn’t a popular opinion, I think USC’s Lane Kiffin is a good coach. USC beat Boston College last week, as the offense improved drastically from the previous week against Washington State. In all the media noise surrounding Kiffin’s job, it’s getting lost that USC’s defense has improved from last season. They have only given up 3.8 yards per play, although they haven’t faced a great offense yet. Vegas has USC as a 6.5 point favorite against Utah State, another strong team from a year ago that lost a coach. Given that Utah State will not end this season 10th like they did a year ago, this spread seems about right.